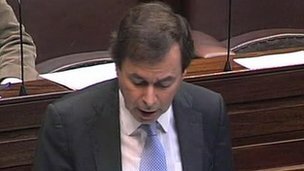 Irish Justice Minister Alan Shatter has announced that a senior counsel is to examine a cold case file on the death of a County Roscommon priest in 1985. Fr Niall Molloy died in suspicious circumstances at a house near Clara in County Offaly. The new inquiry comes after a review of the original investigation and the case files by a police team. It reported to the Director of Public Prosecutions earlier this year, who ruled there should be no prosecutions. On Tuesday evening, Mr Shatter said he wanted to put as much information as was “possible and appropriate” into the public domain. He said he was asking for the new inquiry in the interest of transparency and not because he was unhappy with the work of the Garda Serious Crime Review Team who reviewed the case. Fr Molloy’s family welcomed the announcement of the new inquiry. His nephew Bill Maher said media reports elsewhere in the last 10 days had suggested there would be no further inquiry into the matter. He said the family was pleased to hear that an independent senior counsel will carry out a further examination of the circumstances surrounding the death of his uncle. Mr Maher said the family would welcome the opportunity to discuss this new inquiry with Mr Shatter.